Korean and Taiwanese Drama, Local movies, TV series and game shows – all actors in the show need scripts to portray their roles well and be one with their characters. Same goes in telemarketing. I’ve been a sales rep for more than 10 years. Whenever I do outbound calls, I use scripts as my guide to effectively deliver the message to my prospects. A structured call flow is important and scripts allow the sales reps (especially the inexperienced once) to say the right words and overcome objections. There are 3 parts of the script. Here are some proven Appointment Setting, Call-to-invite and Data profiling scripts that I use when making calls for the following industries. Hi Andrew, good morning. My name is Amanda and I’m calling from XYZ Consulting. We are an IT solutions provider. We provide computer support, network services, backup and disaster recovery, IT consulting, VoIP and phone solutions. I’d like to propose a quick conversation between you and one of our Executives to see how we can assist in reducing your operating costs. Our colleagues would appreciate the opportunity to meet with you and discuss further this. Would you be free on (offer day, date and time of appointment)? Who do you call whenever you have computer problems? Is there any area where you wish think might need improvements on? Note: Jot down the answers. We will send you information as well as a calendar invite. May I have your email address, please? One of our executives will call you on (date of the appointment). Thank you so much for your time. Have a great day! We are an IT consulting company and we will be doing one on one online conference for the whole month of August on how you can reduce your operating cost. I called because we would like to invite you or anyone from your team. Would you be available on be available on (offer day, date and time of the appointment). We would like to send you information as well as email invite, may I please have your email address? We will send you information as well as the calendar invite. Again, the online conference will be on (date of appointment). Thank you so much for your time. Have a great day! Hi, good morning. This is Amanda with XYZ Consulting. Can you please transfer my call to your IT Manager? We would like to send information to your IT manager about XYZ Consulting and how we can help reduce your operating cost. Can you transfer my call to him, please? Thank you. Transferred to the IT Manager. Hi, good morning. This is Amanda with XYZ Consulting. Am I speaking with the IT Manager? Great! I’m with XYZ Consulting. We are an IT solutions and consulting company. I called because we would like to send information about our company and how we can help reduce your operating cost. May I please have your email address? We will send the information to your email address. Thank you so much for your time. Have a great day! Hi Andrew, good morning! This is Amanda with XYZ Company. I understand you are the best person to speak with regarding your working capital requirements accounts receivable? Who’s the best person to speak with regarding your company’s working capital requirements accounts receivable? That’s great! You see, we’re a financial company and we specialize in trade finance for small to medium size businesses here in Singapore. We have helped companies improve their working capital position by providing early settlement of receivables enabling companies to generate cash quickly. I’m calling to see if we could arrange a short meeting with our colleagues to discuss with you about this and how you could benefit from it? Our colleagues would appreciate the opportunity of dropping by your office to discuss further your receivable financing. Would you be free on (offer day, date and time of appointment)? Do you provide credit terms to your customers? If yes, how long does it take for you to get paid? Does the late payment of your receivables put a strain on your company’s finances? Is your growth hampered by your working capital requirements? That’s great! You see, we’re a financial company and we specialize in trade finance for small to medium size businesses here in Singapore. I called because we would like to invite you to our upcoming online conference about how to improve your working capital position by providing receivables financing to help your company generate cash quickly. That’s great. Would you be free on (offer day, date and time of appointment)? We will send you a calendar invite before the conference. Thank you for your time. Talk to you on (mention the date of appointment). Have a nice day! Hi, good morning! This is Amanda with XYZ Company. I understand you are the best person to speak with regarding your working capital requirements accounts receivable? I called because we would like to send you information about how to help improve your working capital position by providing receivables financing for your company to generate cash quickly. We will send you information. Thank you for your time. Have a nice day! Hi Andrew, good morning. This is Amanda and I’m calling on behalf of XYZ Company. I understand you are the best person to speak with about branding and marketing strategy? I was hoping that you might have heard of our company before? We are a global brand consultancy and we help companies create, grow and disrupt markets by integrating research, brand strategy, creative and digital. We have worked with companies such as Airbnb, Unilever, Alibaba Group, etc. My Director would appreciate an opportunity for a brief meeting with you for a further discussion about our branding solution and how we can help improve your branding and marketing scheme. Hi Andrew, good morning. This is Amanda and I’m calling on behalf of XYZ Company, an advertising agency. I called because we would like to invite you to a free online conference about branding strategy that we will be hosting on July 27, 2017. We have 1 in the morning at 9AM and another 1 at 2PM. Would you be available? We will be sending you a calendar invite, may I have your email address, please? Again, the online conference will be on July 27at 9AM. We will send you a calendar with the login details. Thank you so much for your time. Have a great day! Hi, good morning! This is Amanda with XYZ Company. I’d like to speak with your Marketing Manager, please. I’m calling about your branding and marketing strategy, is he available right now? Can you transfer my call please? Thank you. We will send you information. Thank you so much for your time. Have a great day. Hi Andrew, good morning. This is Amanda and I’m calling on behalf of ABC Company. I was hoping that you might have heard of our company before? We are a global business consultancy and we offer free assessment for every startup companies. We have worked with different companies all over Singapore (you can mentioned some of your clients here) take better actions, make better decisions and produce greater outcome with less time and effort for our clients. Would you like to have a free assessment of your company? One of our consultants would appreciate an opportunity for a brief meeting to discuss how we can help your company solve these issues. We would like to send you information together with a calendar invite, may I have your email address, please? Again, the online conference will be on (date of the appointment). Thank you for your time. Have a nice day! We are a global business consultancy. We have worked with different companies all over Singapore (you can mention some of your clients here) take better actions, make better decisions and produce a greater outcome with less time and effort for our clients. I called because we will like to send information about our company and the services that we offer. I’m calling to invite you for a one on one online conference on how to run a free upgrade for your Quickbooks. Would you be free on (offer day, date and time of appointment)? Not all scripts are the same. 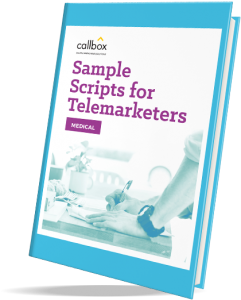 But if you are having a hard time creating one for your team, you can use these scripts to help your sales rep start making great telemarketing calls. Combine Effective Calling script and S.M.A.R.T Calling! How Much should Appointment Setting Services Cost? What Are the Main Challenges for Financial Services Industry 2017?